(c) can and will provide support to the visitor for the intended duration of their stay. I'm a UK citizen. I'm planning to invite my brother-in-law and another close friend to the UK. In my invitation letter, I have clearly mentioned that I'm going to provide them accommodation only. They have prove sufficient funds to support themselves. I have sent them an invitation letter along with a copy of my passport and tenant agreement. What other documents do I need to provide to indicate that it is a genuine professional or personal relationship with the visitor? V 4.4 The third party may be asked to give an undertaking in writing to be responsible for the applicant’s maintenance and accommodation. In this case paragraph 35 of Part 1 of these Rules also applies to Visitors. An applicant will normally be refused where, having been requested to do so, the applicant fails to provide a valid written undertaking from a third party to be responsible for their maintenance and accommodation for the period of any visit. So it's something you should be ready to offer. So from the sound of it being able to show that you are close with your brother in law and friend, as you communicate often and have known one another for a substantial length of time is the key. I imagine that in establishing that a long history on Facebook chats, exchanged emails or record of phone calls together will help, but what they are really looking for is previous visits. Do you fly to visit your brother in law and your friend? Or do you travel somewhere together? Including a list of dates, places when you have travelled to visit them, or they have travelled to visit you before, will go a long way establishing that it is a genuine relationship. Additionally I think that a solid proof can come from the relationship itself. As I was thinking about how would I prove my close ties with a friend I could start by telling the story how we met in an online game 13 years ago. I could then say how we talked outside of the game, met for beers and travelled together across Europe - seeing how many bars we can get kicked out from. How then in recent years I have flown across the globe just to attend his wedding. When you are close to someone, then there are plenty of memories that you share. And when immigration officer asks about the relationship will be the time to share them. The reason for their visit to the UK is also crucial and it must be clear to the Immigration Officer that it is indeed an important occasion, as without it the application is likely to be refused. When inviting your family member or a friend to the UK you do not necessarily have to provide maintenance and accommodation to the invitees (or mention in the invitation letter that you would). Can write only a letter of invitation to support their application - this letter can contain only your invitation, reason for invitation, duration of the visit, relationship to the invitee and employment of the invitee (just to re-confirm) and may be a travel itinerary (time schedule what you plan to do when they visit). Can agree to provide only accomadation. For this you do not need to provide proof of your financial status. 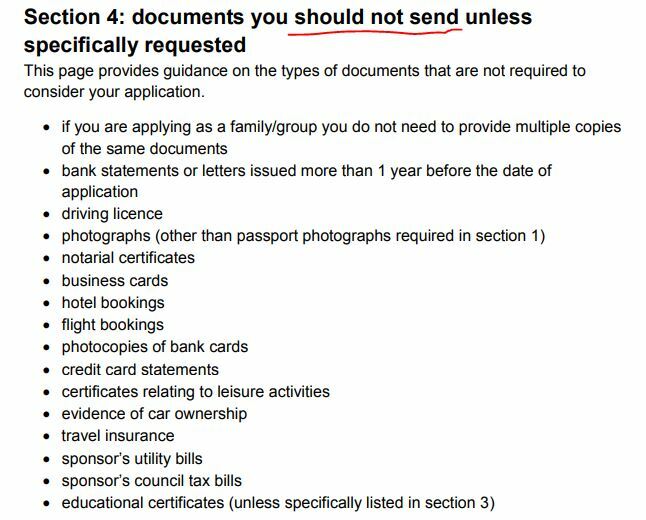 But the invitees should be able to provide evidence that they have sufficient funds to support themselves while in the UK. Also it is better to mention in your invitation letter that your invitees will be using their funds for the trip just to be clear. These are my findings for now. I did not find any specific answer for the proof of genuineness of the relationship. Here are the guidelines for supporting documents. Not the answer you're looking for? Browse other questions tagged uk paperwork standard-visitor-visas applications or ask your own question. How can I prove I am closely related to my sponsor?